The original NFL Blitz was a videogame that anyone could love, not just sports fans. Now EA has come up with Madden NFL Arcade, a videogame very much in the same vein as Blitz. The sad part about Electronic Arts holding the exclusive NFL videogame license is that it killed off the NFL Blitz series. Yes, I know about Blitz: The League, but nothing can compare to the simple, arcade fun of the early Blitz titles. Enter EA Tiburon's just-announced Madden NFL Arcade, a new 5-on-5 football game that looks to be very similar to NFL Blitz, coming to XBLA and PSN in December. While I do enjoy when the sports team located geographically closest to me, and therefore the one I identify with best, scores a point, I am not anything close to a serious sports fan. Still, it was just more fun that NFL Blitz used real NFL teams, and it's cool that Madden NFL Arcade will be able to as well. All 32 NFL teams and their home stadiums will be represented in the game, as 5 players from each are given four downs to go 60 yards to score. Though the press release does not indicate a focus on extremely violent, over-the-top hits like those from Blitz, fast-paced, arcade gameplay is definitely on order. Players will be able to use "Game Changers," which seem like a form of power-ups, to freeze opposing players, turn-off passing icons, and more. I sincerely hope that these extreme hits are a part of Madden NFL Arcade though, as nothing was more fun than constantly demolishing a downed opponent after a play was over in Blitz. Either way, if EA makes a fun game here I'll be happy, plus it'll only be priced at 1200 Microsoft Points or $14.99. The idea for this game is too long overdue, and makes me wonder why it hasn't happened yet. Four player single-console co-op is even possible, there will be online play. 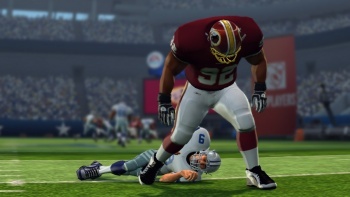 If Madden NFL Arcade has a non-sports guy like myself this excited, I can't imagine this one not being big. We'll have to see just how much EA Tiburon taps into the greatness that was the original NFL Blitz though, or if the development team is able to take that formula even further.